A crawler is a crane mounted on an undercarriage with a set of tracks (also called crawlers) that provide stability and mobility. 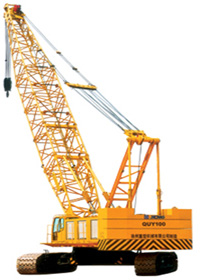 Crawler cranes range in lifting capacity from about 40 to 3,500 short tons. Crawler cranes have both advantages and disadvantages depending on their use. Their main advantage is that they can move around on site and perform each lift with little set-up, since the crane is stable on its tracks with no outriggers. 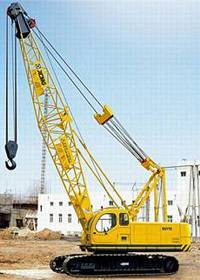 In addition, a crawler crane is capable of traveling with a load. The main disadvantage is that they are very heavy, and cannot easily be moved from one job site to another without significant expense. Typically a large crawler must be disassembled and moved by trucks, rail cars or ships to its next location. XCMG produces several crawler cranes which you can see below.